Each week we will look in depth at the performance of a member of the Everton team, breaking down their display, looking at both the positives in their play and areas for improvement. We will try to break down some of the general misrepresentations that the football media regurgitate week after week and provide a detailed analysis of individual player performance. 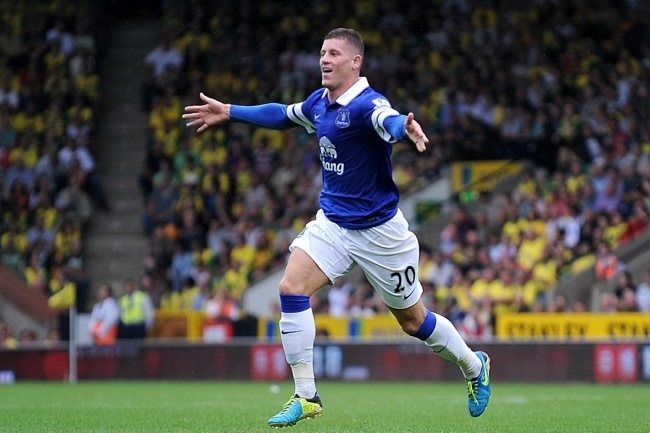 For the first in the series we look at man of the match from the opening fixture – Ross Barkley. Ross Barkley rightly stole most of the headlines after the Norwich City game, with the 19 year old Scouser producing a brilliant performance which drew praise from many leading football writers. For a player so young and relatively inexperienced, Barkley produced a mature display and capped it with a brilliant long range goal. But aside from that goal, what did Barkley do to earn glowing praise from his manager. It certainly wasn’t just in the goals column where Barkley featured. He was the top performer in a number of key areas. 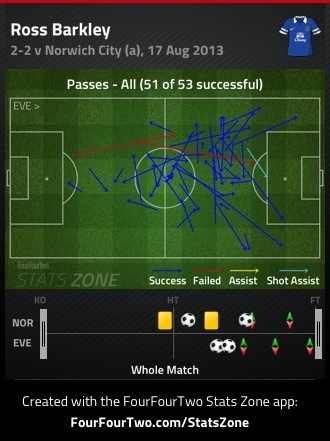 His ball retention was exceptional, as was his distribution, particularly in the attacking third. His ability to regain lost possession was second to none and slowly but surely he is making the decision to run and beat his man at the right time. Last season and the year before, David Moyes often criticised Barkley for his ball retention, using this as a means to nullify rising expectations and to justify his continued absence from the first team. On the evidence of Saturday he has certainly developed that side of his game. The graphic below shows all 53 passes attempted by Barkley, 51 of then were received by the intended recipient in a Blue shirt. At a pass completion rate of 96% he was statistically the best passer on the pitch, with fellow Everton midfielders Leon Osman 93% and Marouane Fellaini 91% the best of the rest. Barkley was even better in the forward third. Crucially and as an indicator of the positive influence Barkley had on Everton’s attacking display, he attempted 23 of those 53 passes in threatening positions, completing all but one. Again the graphic below is quite enlightening and emphasises how quickly Barkley has become accustomed to Martinez’ preferred style of play. The length of the arrow indicates the length of pass, with many in the centre of the pitch, short sharp interchanges, keeping the ball moving at all times. The change in pace is important and Barkley was equally comfortable in utilising the pace on Everton’s wings, bringing Coleman, Baines, Pienaar and Mirallas into play with longer accurate balls out to Everton’s wide men. A criticism I and many others will have heard at Goodison over the last decade, is why do Everton never shoot from outside the box. Martinez has clearly granted the players the freedom to try their luck from distance and it paid off handsomely for Barkley on Saturday. His rasping left footed drive which flew past ex Everton keeper John Ruddy was one of 4 attempts from outside the box by the England u21 international. This third graphic indicates the position of Barkley’s 4 shots on goal, incidentally he had more attempts on goal than any other player in the match, all from outside the penalty area. 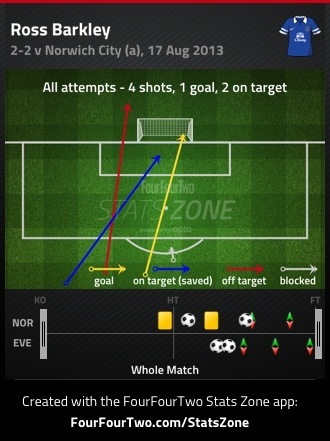 His goal was clearly his best strike of the match. The ball was past Ruddy before he could react, and from this graphic, which appeared in the Daily Mail, it is not difficult to see why the Norwich and England keeper had such difficulties. From 25.3 yards out, the ball hit the bak of the net in less than a second, 0.7 seconds to be precise with the ball travelling at a phenomenal 73.9 mph. 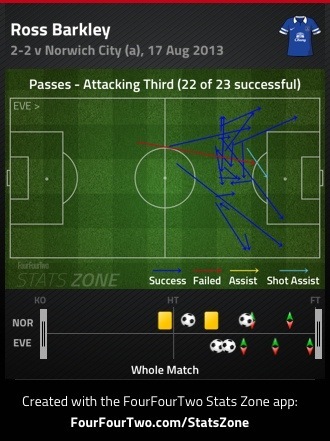 But it wasn’t just in attack where Barkley was influential. Defensively he worked hard to retrieve the ball, earning him praise from former Everton defender Martin Keown, who compared his performance to legendary Arsenal and France international midfielder Patrick Vieira. Barkley regained the ball from a Norwich player 9 times in the match, again putting him top of the statistics for the match in this area. The graphic shows his willingness to track back from his attacking midfield role with 6 of those 9 tackles in his own defensive half. Now if we want to be ultra critical and some will be, Barkley did lose the ball on 2 occasions as he attempted to beat an opponent. 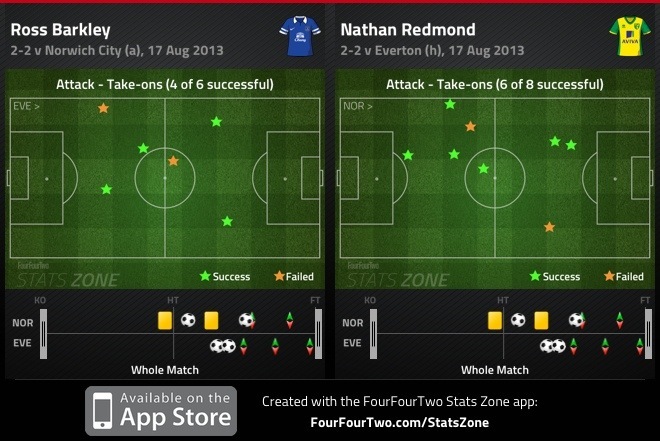 But his 4 successful ‘take-ons’ did put him top of the Everton dribblers, but behind top dribbler in the match, Nathan Redmond of Norwich City, who beat his man on 6 out of 8 occasions. This was certainly Barkley’s best display in an Everton shirt and he is clearly relishing the trust and responsibility that new manager Martinez has in his abilities as a footballer. We have known about Barkley for sometime and he has demonstrated his mental strength to overcome some horrendous injuries earlier in his career. After making his first team debut as a 17 year old, he was denied a run in the team by David Moyes’ more cautious approach to management. We have often heard people criticise his mistakes and this has been used to justify his exclusion from the team. But show me a player who doesn’t give the ball away…that player simply doesn’t exist and the more you put the ball at risk, the more you try to do something special, something most average players could only dream about, then of course you will occasionally lose possession. But want singles Barkley out and what will make him one of the great players is his determination, willingness and ability to win the ball back. As he approaches his 20th Birthday, Barkley appears to be maturing into a fine footballer and at 25/1, he would appear a strong contender for the PFA Young Footballer of the Year award. Please let us have your thoughts on Barkley and his role in the team. In your opinion, how good was his performance against Norwich and how far can he go? Is this summers World Cup a realistic aspiration for Barkley? Previous Post Is it too late to sell Fellaini? on behalf of MUFC i would like to offer £1M for him….is that ok or…?? Are you sure you don’t want him thrown in for free as part of the Baines and Fellaini deal!!! Excellent article, Daniel – Ross displays a combination of Gazza’s close control and the explosive finishing of Wayne Rooney – if he stays injury free he must surely get an extended run in the team – and all the way to Rio next summer…. I think Carragher likened him to Gerrard on Monday night football. As much as I dislike Gerrard we have got one fantastic player if he can reach a similar standard. Wouldn’t it be brilliant to see him score from 25 yards in front of the kop!